Zombies are very much in Fashion this time of year. My grand children were getting ready to go on the Toronto Zombie Walk and so was my Nick! The hair comes from a rubber wizard mask I took apart. Just glued the hair using spirit glue. Although very effective, the beard was annoying and kept getting in my mouth. I was glad to take it off. Next time I wear a long beard I will glue it clear of the mouth. In that way I'll be able to eat and drink. Make up around the mouth will cover the lack of beard in that area and the beard will be comfortable to wear. The hat is from the dollar store too. It was part of a witch hat and I just cut off the brim. The shirt should have been more colourful but I did not have much time to get my costume together so blue it was. Just do a search for garden gnome and find one you like. The Hat is felt. I took apart a cheap dollar store witch hat. Very fun and over the top. 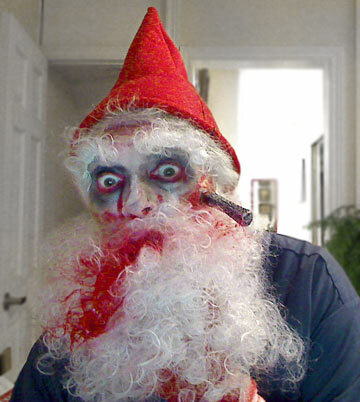 I don't think you can do anything wrong when making a zombie gnome face! I started with a white cream. Added a yellow and purple bruise. I had stuck on a fake spike with spirit glue and used red lipstick as my red blood. The beard and pants are covered with acrylic paint in the most lurid of reds. I used some black eye shadow around the eyes and some red lipstick around the eyes. 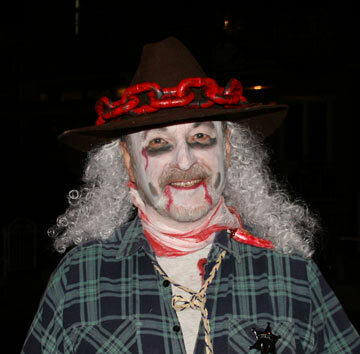 This year's theme for the Zombie Walk is Zombie Chefs and Waiters. 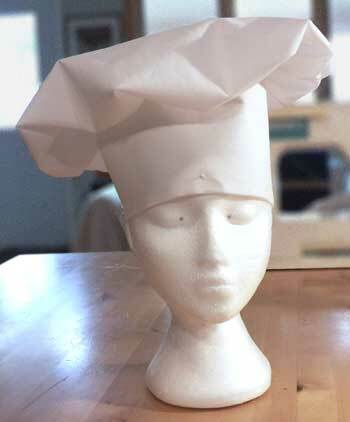 Here I'm making chef's hats The kitchen is no longer safe. 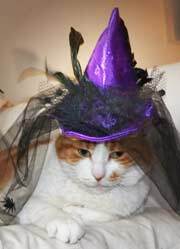 Detailed instructions on how to make and fit a witch or wizard's hat. Good Simple video on how to do a zombie make up. Liquid latex is used to make fake dead looking skin, scabs, warts, wounds and other prosthetics. It can be used to stick and blend in fake noses and chins. Books on special effect make up including zombie. Need help with your sewing? Beginner's sewing kit has scissors, needle and thread, measuring tape and more. SMALL PRINT: This information is for entertainment. If you sew be careful and watch out for small kids and sharp instruments. Latex can be irritating so check on a small skin area before using to make sure you are not allergic. Be safe and have fun.